happy may, everyone! i absolutely love this month. not only is it my birth-month, it is also the month that the weather starts looking up in toronto. i'm a spring & summer junkie! i've usually finished my seasonal clothing rotation by the first weekend in may so i feel extra motivated to get dressed in the morning. here are a couple outfits i wore this weekend... note, skirts & dresses are pretty much de rigueur for me when the weather is warm so you will be seeing tons upon tons of skirts & dresses over the next few months! my hubby and i brought lulu to the drake hotel spring market. there was a really cute and interesting assortment of accessories and knick knacks for sale! the market was smaller than i expected so we didn't spend a lot of time there. 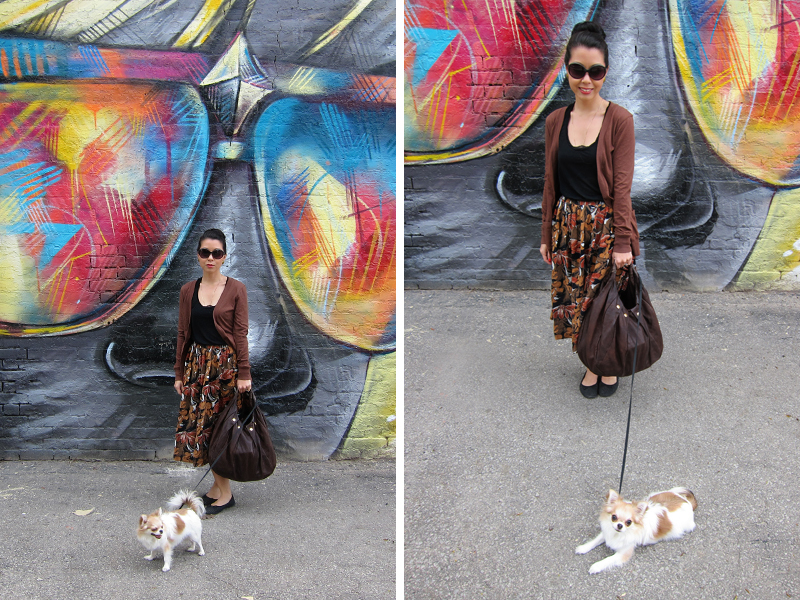 instead, we walked to kensington market and bought spicy beef patties on coco bread. then we sat outside courage my love and gobbled them up. you may notice in the second outfit that i'm sporting the same hairstyle (but messier). this is the same sock bun i wore the previous day. as in, i came home yesterday, slept on my sock bun, woke up, got ready, and left the condo without re-doing my sock bun. how's that for lazy? a few pieces started falling out towards the middle of the day but i just tucked them back in and the sock bun held up very nicely otherwise. my dear friend christina bought me the clutch pictured in the below photos. she works at a thrift store in london (england) and she brought it back for me when she came to visit in late april. what a perfect gift! it is totally my style and i love love love it. p.s. i am loving the cheeky monkey nail polish in party whore! the super vibrant red-coral screams summer. You look great! Love those types of weekends, I wish the husband and I could have more of those! thanks elaine! i wish we could have more of these types of weekends too... they are definitely my favourite!